Lowrance, a world-leading brand in marine electronics since 1957 and GPS navigational systems since 1992 — announced its next-generation, solid-state Broadband 3G™ Radar. Building on the award-winning technology of the Lowrance BR24 Broadband Radar™, the world’s first recreational marine Frequency Modulated Continuous Wave (FMCW) radome, the Broadband 3G sets a new standard in radar performance. Delivering two-times greater RF transmit power and 30 percent more range and target detection than the BR24, the 3G allows boaters to see objects such as small boats and channel markers at greater distances without compromising its exceptional close-range radar capacities. Combining straightforward installation, flexible antenna placement options, low power draw and unrivaled performance, the Lowrance Broadband 3G Radar provides the safest navigation possible in all weather conditions, at a significantly more affordable price. The new Broadband 3G Radar is the next step in revolutionary vessel navigation and collision avoidance, providing boaters with superior target definition and separation in close quarters where traditional pulse radar is blind. The Broadband 3G Radar offers crystal-clear, highly detailed views of surroundings at a range scale down to 1/32 nautical miles (200 ft.), and marks objects within 2 meters (6.5 ft.) of the boat. Incredibly safe, the new radar transmits 1/10,000 the power of traditional pulse radar – less than 1/5 the energy of a mobile phone – making it safe to install just about anywhere on a boat. Other innovative 3G features include advanced clutter rejection which virtually eliminates tuning, and rapid cold start and InstantOn™ which enable the radar to power up instantaneously from standby. With incredibly low power consumption, it is also 30 to 50 percent more efficient than traditional pulse radomes. In addition, Broadband 3G Radar supports chart overlay, display networking, MARPA and True Motion Rader Display to distinguish moving vessels from fixed objects or landmasses. 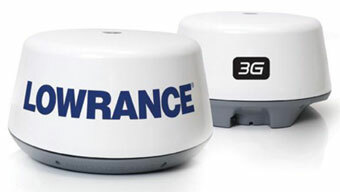 The Broadband 3G Radar is compatible with Lowrance’s award-winning HDS multifunction displays. Also available in the Simrad Yachting and B&G model lineup, it is compatible with Simrad Yachting’s full range of brilliant NS navigation systems – the NSO Offshore, NSE Expert and NSS Sport and the award-winning B&G Zeus sailing navigation system. The Lowrance Broadband 3G’s compact 18-inch radome measures 11.02-inches high x 19.28-inches diameter (280 mm x 489 mm), weighs 16.3 pounds (7.4 kg), and installs quickly with an easy-to-route 0.5-inch (13.5 mm) diameter scanner cable. Drawing only 18 watts of power during operation and 2 watts in standby, the Broadband 3G has an operating temperature range of -13 to +131 degrees Fahrenheit (-25 to +55 degrees Celsius) and can operate in winds up to 100 knots. The radar transmits on the X-band with a frequency of 9.3 to 9.4 GHz and has a sweep rotation frequency of 200Hz. Its antenna has a peak power output of 165 mW. The Broadband 3G is waterproof to the IPX6 standard and protected by a two-year parts and labor warranty. Navico is the parent company to five leading marine electronics brands: B&G, Eagle, Lowrance, Northstar and Simrad. These brands offer premium solutions within every segment of marine electronics, making Navico an industry leader and the largest marine electronics manufacturer. Navico has development and manufacturing facilities in the USA, Mexico, UK, Norway and New Zealand and is headquartered in Oslo, Norway. Navico’s global distribution network covers over 100 countries across 8 time zones.